3) To have great conversations that cut through the glossy digital lipstick veneer and elaborate entertainment, to debate the reality of whether this industry can truly evolve beyond its current “all about scale” predicament. And this year, did we get just that – with a new energy that has been lacking in recent years since the recession. What I love about this networking event is the sense of common purpose, community and belonging you get as part of the services industry, which you do not get at most other events (especially Stateside, where some conferences still seem to be stuck somewhere in 2004...). At NASSCOM, you don't feel that outsourcing was that "accidental career" choice you just happened to fall into because you could never figure out what you wanted to do with your life. You actually feel part of something - and part of history as well as the future. Just bumping into the legendary (and very fit and energized) Pramod Bhasin (the founder of Genpact), who could (and probably should) be lying prostrate on some beach checking the number of zeroes on his bank balance - and hearing his passion for doing more for the Indian services industry - tells you something about the DNA that will keep brand India at the forefront of technology-driven business services for a very long time to come. But let’s not get too carried away by the hype of the moment. India’s services economy has some big challenges, but it really does have the nuts and bolts to lead the way into this unraveling Digital future, and play a significant role in the emerging As-a-Service Economy. For example, the more I learn about Robotic Process Outsourcing (RPA), the more convinced I am that some of the ambitious Indian-heritage firms will be at the forefront of development and capability here. I am already witnessing a strong appetite to cannibalize some shot term revenue with clients to develop beta solutions that can be re-used for the future, and scaled across multiple clients. The common-sense to transform a $10m engagement that has 20% profit margin into a $7m engagement at 50% profit, is not just lip service from the service provider executives attempting to placate cynical analysts, we hear this from an increasing number of clients. Meanwhile, too many of the traditional Western-centric providers have massive scale deals involving hundreds, and even thousands, of FTEs and have a real problem when it comes to changing the pricing model at the risk of taking a hit on short term income. Sadly, most of the incumbent service providers are today looking at their current client portfolios and thinking “Why on earth did we take on some of these low-value FTE-centric deals where the clients refuse to do anything beyond complain about us not taking out enough cost, and are too insecure to increase the scope of the work to create a more value-driven, rewarding relationship”. Conversely, most of the leading Indian-centric providers have built up their businesses on a plethora of mid-size deals ($5-$25m) where the FTE model simply will not make sense for their clients in 3-5 years’ time – why pay for the same 20 bodies every year? They will want to see some incremental improvement on cost and efficiency, and will change to a new service provider if their incumbent insists on a status quo scenario. What’s more, RPA will shift services to be delivered smarter not cheaper, where business-centric staff can focus on delivering services at higher value, as opposed to surplus numbers of programmers and transactional staff being employed simply to keep workflows and operations functional. There are a few Indian-heritage providers today who must be thanking their lucky stars they never dived headfirst into the lift-and-shift BPO business – it’s so much easier to drive value into less complex engagements, where there is less risk as stake to make a few sensible bets for the future. With regards to mobility, I have only been impressed with the focus of many Indian-centric providers to embed consumer-centric mobile processes into enterprise solutions. Digital is about bringing the service providers closer to the customers of their enterprise clients, and is driving the need for capable mobile, social and analytical solutions to be weaved into the service delivery. And however to do this, you really need to be able to transform the automation layer for clients, which is the foundational building block for digital transformation. This is where India’s stars are facing some significant challenges, namely transitioning and training staff to approach client solutions from more of a business, and less of a technology, context. In 2020, I am willing to bet my house on the fact that NASSCOM will be all about business solutions, with noone being remotely excited by the digital plumbing that has made it all possible. So what does this mean for the millions of developers who just live for code? It means we’re going to need a bit less tech and a lot more business-context support. It means India’s universities need a bit less ABAP and a bit more MBA. It means India’s most ambitious service providers will be investing heavily in world-class HR to identify their talent potential, retrain it and frame entirely new career paths. It means India’s services industry leaders and populace are going to have to demonstrate a stomach for change, the likes of which they have never experienced. 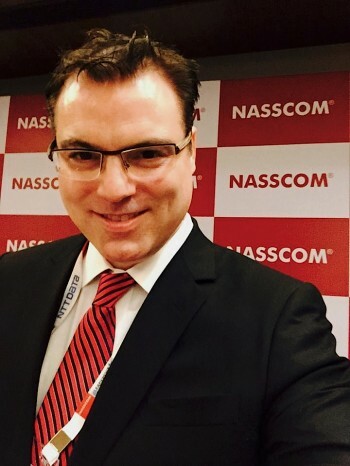 At NASSCOM, about 40% of the service providers I spoke with really get what’s happening, and are already making some investments to make this tech-2-busness shift; about 30% recognize what’s going on, but are still figuring out their play; however, a good 30% are like deer in the headlights – they just can’t grasp the change and I generally worry whether they can continue on a healthy growth path, and can break out beyond their pure-tech approach to service delivery. Yes, talent transformation is a big, big challenge for India’s services economy, but it’s not as if all the North American and European service providers and consultants are making massive investments to change their delivery model? Most of they seem more focused on shedding costs than buying capability. This is critical, in my opinion. Nearly all of the solutions today are largely being driven by vendor-push as opposed to client-pull, which is fairly typical as new ideas and technologies are launched onto the market. At HfS, we get calls from clients to discuss Digital, RPA and so on, but more because they just want to know what the fuss is all about, than the fact they are ready to move with an executed strategy and plan. ‘Born in the cloud’ firms which are rapidly emerging today, who want everything sourced, delivered in the cloud, mobility-enabled and perfectly automated. They don’t have that legacy operations infrastructure of dysfunctional ERP instances, poorly stitched-together processes and staff still living somewhere in 1996 running it all. They will also make up a good portion of the Global 2000 in 2020. These clients are demanding a fast journey to As-a-Service, and want to move to a platform-driven environment as quickly as they can, where they can literally "plug-in" to standard digital processes and capabilities. This is where investments in digital platforms that bring immediate process solutions is critical - and the ability to work at speed with impatient clients not waiting to make massive upfront investments in transformation services. The ‘traditional enterprise’, which has a quagmire of legacy business process and technology that need overhauling and will take years to ease its way toward as As-a-Service mentality. Change is expensive and painful for these firms and they will only really invest in it when their core business model is under true threat. For example, healthcare payer firms in the US must have digitized customer management capabilities now they are directly servicing consumers via their iPads and not only corporations. And most retailers will simply die if they can’t have digitally effective commerce solutions to sell their wares and manage their supply chains effectively. While these clients will demand fast change, most have/are/will struggle to evolve from breaking from their legacy systems and writing off their technical-debt. Moreover, they need the skilled consultative ability of a services partner who can help steer the change management program for them at a pace they are comfortable. This is where Indian-heritage firms can often struggle, where a "white shoe" approach is often needed. India-heritage service providers need to figure out how to approach their clients to develop a plan to take them where they want - and need - to go. Most of today's Indian-heritage providers struggle to diversify their approach with clients - they are trained to sell, sell, sell and it often results in clients being turned off by their approach. The Indian-heritage firms need to make serious changes in how they manage their clients, the behavior of their account managers, and their ability to have much more of a listening and consultative relationship. When India built its IT services economy in the 80’s, 90’s and 00’s to become truly formidable, it did so with incredible purpose from its leading IT services providers and support from its government. The plan was simple – go after the incumbents like EDS and IBM with much lower-cost offerings that changed the game. The incumbents were asleep at the wheel and simply let it happen. In the last few years, the likes of Accenture, IBM, HP and Capgemini have developed huge Indian organizations to remain competitive and win back some of the lost market share. So today, the playing field is now a lot more level, and there are no more surprises in store – everyone will have their Digital/RPA/Mobile/Analytics platforms beautifully designed on a PowerPoint deck winging its way to you very soon. This is now more about talent and culture than anything else – and the race is on across the leading providers to develop their own people programs to deliver more business-centric solutions to clients, to solve problems proactively than merely fix processes. This isn’t going to be the cakewalk it was in 2003, when all you needed was an army of programmers and project managers, and a decent internet pipe. However, where I see India having a genuine advantage here is an ability to go where the business is – a tenacious culture to push new ideas and innovations onto clients, many of whom love the humble, can-do attitude of most of the leading Indian-heritage service providers. Whether all of these firms can become more MBA and less ABAP is still very much open to question, but at least the smart ones have their eyes wide open and know what they need to do. Net-net 2015 is a phenomenal time to be a services professional - there is so much opportunity for career growth, whether you are an analyst, consultant, practitioner or service delivery professional. Complexity and change drive new growth and opportunity - it's time for the ambitious people to get ahead of this and embrace the challenge! A refreshingly honest and balanced article, Phil. You bring out the hope, the challenges and the opportunities in your own very entertaining way! Hi Phil, I am a fan of your direct style of writing. I loved this post. Thanks Phil, very insightful and perceptive piece. You've hit the nail, and your comment sums it up: "The Indian-heritage firms need to make serious changes in how they manage their clients, the behaviour of their account managers, and their ability to have much more of a listening and consultative relationship." My only worry about your comment "...more MBA and less ABAP..." is whether they try and approach business in the same formulaic fashion - time will tell. Phil, Thanks for the swift response. I tend to agree on most counts, altho' I would say that Indian players have already been good at gaining university support -perhaps initially more as means to supplement branding. In this respect I feel they need to incorporate, but also broaden beyond "data science" graduates. They have built a solid reputation for systematic approaches (perhaps a strength of the 'Indian mindset'?). These - and others - are the building blocks in place - but customers are waiting for the next move. They need to throw a bit of caution to the wind (and some dollars) and take the leap to create a more portfolio that balances a quarter-by-quarter focus alongside a longer-term view. In looking at the longer-term view, they will start to develop the client consultancy/transformation credentials much needed. While digitalization, business/solution orientation and change/complexity management along with a long-term strategic relationship based account management approach are key to the future success for the Indian IT Services Providers, for the most part - at least in the Financial Services segment, a lot of Clients still seem to be using providers just to augment staff with a lower cost headcount play. For the service providers to step back a little from the Q-on-Q focus and take a longer term view on their relationships, Clients - especially the mid-to-senior management - too need to be open to see beyond $/hr comparisons and take a collaborative approach to building strategic partnerships that result in value creation for themselves as well as their vendor-partners. Great post Phil. Was at NASSCOM and attended your session with Rohit and Sean. I caught the same feeling of the 'buzz' this time at NASSCOM. There is a sense that we are on the cusp of something but not quite sure of how to get there. The talent issue is a big one, as is the issue of local nuances that are so important when doing an analysis. I see the Indian Service providers investing a lot in the upskilling of talent because its worth their while to do so, just as they did and are doing with the current generation of IT and BPM. @ Paul, Data Scientists vs Business Analysts - I don't think its either/or - I think both are needed. Based on what I heard, the B2B2C model is going to bring about the transformation. Those service providers that can start having those conversations will win a seat at the table. The ROI for actually being able to deliver what the client is asking for is so huge, the investment will be worth it. Congratulations Phil. This is an amazingly insightful article. Any thoughts on how a BPO services professional can change to the track of RPA, Digital, Analytics etc. I would be very much interested. 1) "The B2B2C model brings about the transformation" - completely agree. Helping enterprises serve their customers more profitably and effectively is the only true way to add value when you look at how their digital strategies need to work. Simply providing the "digital tools" isn't going to be enough, it's about understanding their business and weaving them into their digital environent. It's like SaaS - there's limited value just providing the APIs and getting the platform functional, it's about providing the organizational support to redesign their talent and processes to make the SaaS effective. In the past, there was more value in the tech implementation area where on-premise software brought a whole set of integration and technical issues... those needs are reducing with processes and services being delivered in the cloud. 1) Firstly, press your own service provider employer to have a more formalized training program to get your using tools of the core analytics/RPA tools. I would say, focus should be to create more Moonshots and less Incremental. The industry is crying more service delivery innovation, how to reduce RTB (Run the Business) cost by 50% + and re-invest in CTB (Change the Business), this cannot be achieved thru traditional efficiency levers. Platforms needs to be revised with a plug and play approach to service delivery. This will also force firms to structure themselves differently..i.e not have siloed BPO, Apps, Analytics etc..but be more function/business oriented. Smaller players or born in the cloud providers will have the advantage of starting off that way. Can the elephants dance?..perhaps those that can will win this leg of the race..